Whether you’re 5 years old or 50, snorkeling for the first time can be a little intimidating with all of the unfamiliar gear and underwater exploration. But you’re in luck: the gentle waves, shallow waters, and easy beaches at Playa Mia are just perfect for first-time snorkelers. 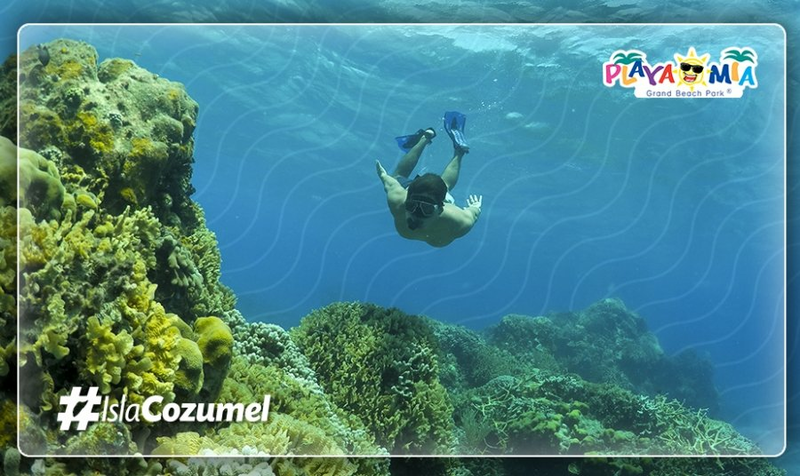 Follow these helpful tips and you’ll be sure to make the most of your snorkeling adventure. Make sure your mask, snorkel, and fins fit your body. Didn’t bring your own? You can rent snorkel gear starting at $30 at Playa Mia. Practice putting on your fins and mask/snorkel several times. You want to be familiar with the process in case you have to do it in the water. Practice breathing through your snorkel in a swimming pool or calm, shallow area of the beach. It feels weird at first, and it takes a little getting used to. Check your gear. If your mask is leaking, adjust it. Practice clearing your snorkel (blowing hard to get all the water out) and swimming with your fins. Not a strong swimmer? Use a life jacket or another floatation device. If you’re worried about swimming, it can detract from the experience. If you start to feel anxious, remind yourself to take slow, deep breaths. You can come up out of the water at any time. Now grab a friend and go snorkel! Be sure to check out our Underwater Mayan City! Ready for another adventure? Book our Short Snorkel Tour and hop on a boat to explore one of the island’s stunning coral reefs. We also offer longer snorkeling tours for cruise passengers and other travelers. Want to know more? Please contact Playa Mia today!